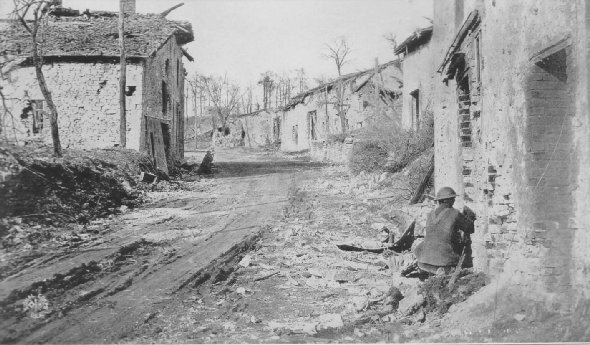 Advance guard on a road leading into Cunel, October 29. German machine gun nests were in trees overlooking the road. 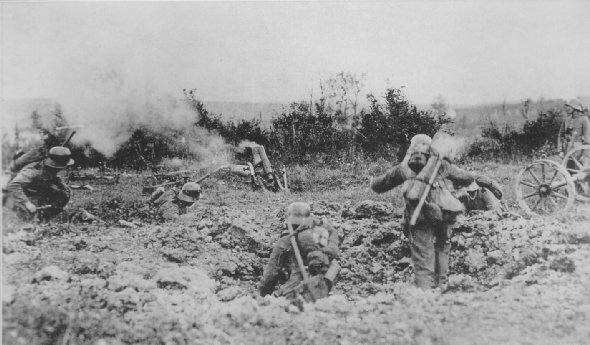 "KEEP YOUR HEAD DOWN, ALLEMAND"
German trench mortar in action. 170 mm., Minenwerfer or mine thrower, fired 150 pound shells, range about 3000 yds. Photo by U. S. official photographer who, dressed in the field gray uniform of the enemy, with his miniature camera cleverly concealed, wriggled back across No Man's Land at night, and lived to develp his negatives.